Spock was an outsider; Leonard Nimoy was not. It’s an interesting paradox—an actor best known for playing an alien driven by cold logic on Star Trek was in real life a kindhearted, gregarious man who projected a mixture of counterculture ’60s swagger and old Hollywood glamour. For many fans it feels nearly impossible to separate Mr. Spock from the actor who played him. Nimoy himself even claimed the character’s calm logic influenced his own personality. But if that’s the case, then both Spock and Nimoy should be remembered as much for their humanity as for their intellect. 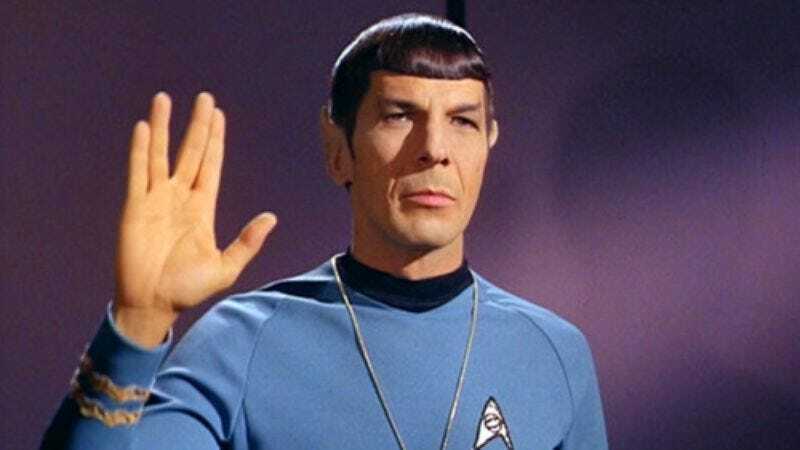 The actor died at his home in Los Angeles today at the age of 83, and while his career included everything from military service to music to poetry, he’ll always be remembered first and foremost as Star Trek’s iconic Vulcan and the show’s best ambassador. It was Nimoy’s ability to suggest the warmth behind Mr. Spock’s unflappable exterior that made the character so iconic. Though the half-human, half-Vulcan was the show’s only alien crewmember, his desperate desire to belong somehow made him the most instantly relatable crewmember on the Starship Enterprise. Fans long connected with the intelligence and empathy hidden just beneath Star Trek’s colorful sci-fi surface, so it makes sense that Nimoy’s similarly layered performance would become the heart and soul of the series. Yet Nimoy almost wasn’t a part of Star Trek, or at least that’s how the legend goes. In 1965 Gene Roddenberry created a pilot for a sci-fi series he billed as “Wagon Train to the stars.” CBS executives hated it, particularly its serious cerebral plotting, strong female co-lead, and the weird alien with pointy ears named Mr. Spock. When Roddenberry got the chance to make an unprecedented second pilot, he made some big changes, like adding the charismatic William Shatner as Captain Kirk and turning the female first officer into a more conventional nurse. But Spock, he argued, was here to stay. It was a smart choice. Nimoy remains in the top tier of Trek actors, and without his grounded performance the show could have easily flown off into pure camp. Episodes like “Amok Time,” “This Side Of Paradise,” and “Mirror, Mirror” show off Nimoy’s subtle skills and wonderful comedic timing. And he directly shaped Trek iconography too: The proudly Jewish Nimoy adapted a Hebrew blessing into the famous Vulcan hand salute. From 1966 to 1969, the show used its sci-fi premise to challenge racism, critique the Vietnam War, broadcast one of the first interracial kisses, and occasionally get really, really silly. But while Trek launched Nimoy to stardom, it wasn’t immediately clear when the show went off the air just how much the role of Mr. Spock would come to define his career. Instead, he planned to return to the life of a working actor he’d long enjoyed pre-Trek. Born in Boston, Massachusetts, on March 26, 1931 to Orthodox Jewish parents who had emigrated from the Soviet Union, Nimoy enjoyed a moderately successful acting career in the 1950s and ’60s. He starred as a street-punk-turned-boxer in the 1952 film Kid Monk Baroni, and played smaller roles in B-movies and TV shows like The Twilight Zone, Sea Hunt, Rawhide, Perry Mason, and Get Smart. He studied acting briefly at Boston College before completing two years of military service for the United States Army. He married Sandra Zober in 1954; their daughter Julie was born in 1955, and their son Adam followed in 1956. Nimoy was teaching Method acting when he got offered Star Trek, and he turned down a role on the soap opera Peyton Place to take it. But like the Enterprise’s tractor beams, Star Trek was a force the show’s cast couldn’t escape. Thanks to syndication, the show developed a massive fan base after its cancellation, so Paramount reassembled the cast for 1979’s less-than-stellar Star Trek: The Motion Picture. Thankfully, 1982’s Star Trek II: The Wrath Of Khan course-corrected in a big way and revitalized Trek as a successful big-screen franchise. The film works in no small part thanks to a climax in which Spock sacrifices his life for his crew. His iconic goodbye scene wouldn’t work if Nimoy couldn’t so masterfully convey both Spock’s logic and his compassion. By the time their final Star Trek film hit theaters in 1991, the show’s original cast had become pop-culture icons. It was a new phase for Nimoy; he and Zober divorced in 1987 and he married Susan Bay in 1989. Rather than return to acting, Nimoy threw his creative energies into other avenues. He continued directing (most notably 1987’s Three Men And A Baby), exhibited photography shows, and started writing both poetry and prose. But more so than anyone, Nimoy remained an ambassador for the Star Trek franchise. He reprised his role for an episode of the spin-off series Star Trek: The Next Generation (in which Spock was a literal ambassador) and appeared in both of J.J. Abrams’ rebooted films. His 1975 autobiography, I Am Not Spock, and his 1995 follow-up, I Am Spock, help track his growing acceptance of his association with Trek’s most famous Vulcan. I was lucky enough to see Nimoy in person at a Las Vegas Star Trek convention in 2007, where he and Shatner delighted the crowd with their easy chemistry. They’d be doing the convention circuit long enough that it felt like old hat. But when a precocious 10-year-old boy dressed as Spock took the mic, Nimoy appeared genuinely charmed. After answering the kid’s question he paused for a moment and asked if he could fly the kid and his whole family to the upcoming Star Trek premiere. Sure it was a nice bit of PR, but it also felt like a small moment of human connection at an event marked by grandeur. The Star Trek fandom couldn’t have asked for a better ambassador than Leonard Nimoy, and he’ll be dearly missed by fans around the world. Yet Spock encouraged others to “Live long and prosper,” and it’s worth celebrating the fact that, for his part, Nimoy did.